The cover for Volume 7, featuring Bender. Volume 5 is a boxset collection release for broadcast season 7 (also known as Season 6-A; part of season 6). On DVD, it was released in Region 1 on 21 December, 2010, in Region 4 (where it is known as Season 5) on 2 November, 2011 and in Region 2 (where it is known as The Complete Season 5) on 26 December, 2011. On Blu-ray, it was released in Region A on 21 December, 2010 and in Region B on 28 March, 2012. "Fry's Crudely-Drawn Comic Book - The Crudely Animated Edition"
"Fry's Crudely Drawn Comic Book Alternate Design"
In the UK, a limited edition was also released. A copy of the script for "The Late Philip J. Fry"
^ Lambert, David (06 October 2010). Futurama - Bite My Shiny Metal Blu-ray! 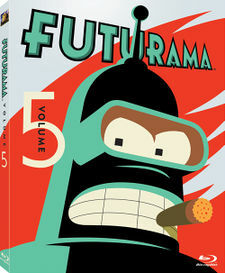 Bender Graces the Cover of 'Volume 5' on DVD and BD. (TVShowsOnDVD.com.) Retrieved on 07 October 2010. ^ a b Futurama - Season 5 [DVD]: Amazon.co.uk: Billy West, Katey Sagal, John DiMaggio, Tress MacNeille, Lauren Tom: Film & TV. ^ "Futurama - Season 5 Limited Edition with T-Shirt and Script" at Amazon.co.uk. This page was last edited on 21 December 2015, at 21:10.